There seems to be a theme running through the Gulfshore Playhouse blog this week, and at the risk of bandwagon jumping, I must say, I have some Harry Potter love to share as well. 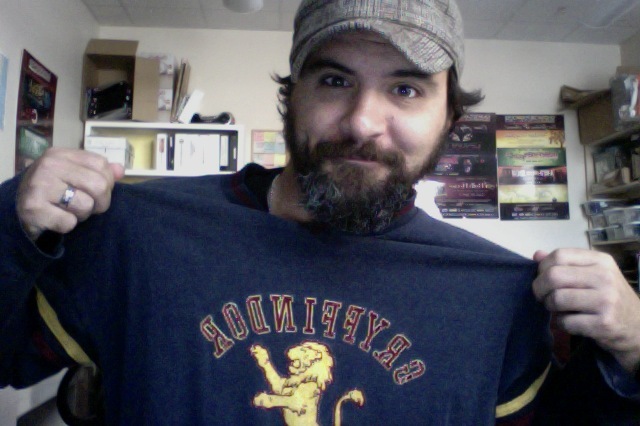 No, today “some love” will be given to my Gryffindor Quidditch Jersey. Yes, my friends, you read that correctly, my quidditch jersey. And in fact, the thrust of this blog post will be the analogy between said jersey and my acting process. Get ready for a seven-layer cake of nerd y’all. This morning I awoke to a somewhat chilly and blustery day. I am in Naples, FL, so that means it’s in the mid-sixties…brrrrr…but none-the-less a comparatively chilly day for us Floridians. And with the wind blowing and the overcast skies and fall in the air, that wonderful feeling of welcome melancholy washed over me. A perfect morning, in fact, to turn off the alarm, go back to bed with a warm cup of cocoa and a good book (oh, I don’t know, maybe something by J.K. Rowling) and ignore the business of the day. But, alas, some theatre needs to get made, and some grants written, and this endearingly tongue-in-cheek blog wasn’t just going to write itself. So out of bed I hopped and after taking an invigoratingly hot outdoor shower (did I mention it is in the sixties…brrrrr…. ), I turned to my dresser and from the bottom of the drawer I pulled my comfort shirt. I know you know what I mean. We all have at least one. Something that feels just right on the skin, or that you’ve had for a long time (over a decade in this instance), or that hides you in just the perfect way, or reveals something about your soul in a subtle or overt manner, or makes you remember another time or place, or any combination of these things. So on it went, my armor for the day. My soft, nerdy, merchandised armor, protecting me from the world. And that is completely, and I would think transparently, analogous to my acting process. But if in fact I am wrong about the transparency, I will explain a little further. My approach to learning lines is to get them deep, deep into my brain, into my body, so they feel lived in, second nature, and consequently (and perhaps ironically) that enables me to then say them as if for the first time. And my physical life as the character is a way of adding a layer between the real me and the “me” that is trying to convey the story to the audience. The emotional life of the character, something that I try to create by imagining myself in the circumstances in which the character finds themself, is something I show the audience through a series of subtle and overt revelations. Sometimes I want to hide my feelings from the audience, make them work a little harder to imagine what my character is feeling (and therefore engage their imagination and empathy about how they might feel), and sometimes I want them to know exactly where my character is, unambiguously. These things, and others (the trust created among the cast, the costume, the guideposts and structure given to me by the director) all go into to knitting my “comfort shirt.” And I wear this armor, soft and pliable, protective and revealing, to keep a part of me safe. And as long as that part feels safe, I can go out on that stage and be daring, and share huge parts of myself, and bare my soul, and open up in front of a group of strangers. Yep, there you go, seven-layer cake of nerd, y’all. I told you. But find that comfort shirt (or sweat pants, whatever). Find that little piece of you to keep safe, to hide, just a little piece. And only so that you can feel safe enough to go out in the world and be brave and daring and share yourself completely. Seven layer nerd cake is my favorite kind!